Charity began working with Cascade Connections shortly after graduating from Ferndale High School in 2008. When she first came we spent time getting to know Charity and her skills and abilities and then set out to find the right employment for her. Our staff met with the Human Resource Manager of Cascade DAFO, Cathy Thomas, to tour their facilities and learn more about their company culture. By touring the facility we saw what types of skills and environmental factors might play a role in finding an ideal candidate. One area identified was the production of “flippers”, which are the samples sent to clinics that allow children to design their own orthotics. These samples play an important role in helping children to get excited to wear their new orthotics. Cascade DAFO mentioned that the perfect candidate would be someone who the company also serves as a customer. It just so happened that we had just the right candidate for the job, Charity. Charity had been wearing DAFO braces since she was a little girl. It was only because of these braces that she is able to walk independently. Charity and her family were thrilled at the possibility of working at DAFO; Charity had even been to the facility several times to get her braces adjusted or fitted and knew several people there. Cascade Connections helped Charity complete her application and arrange an interview. After her interview Charity was hired for the position. 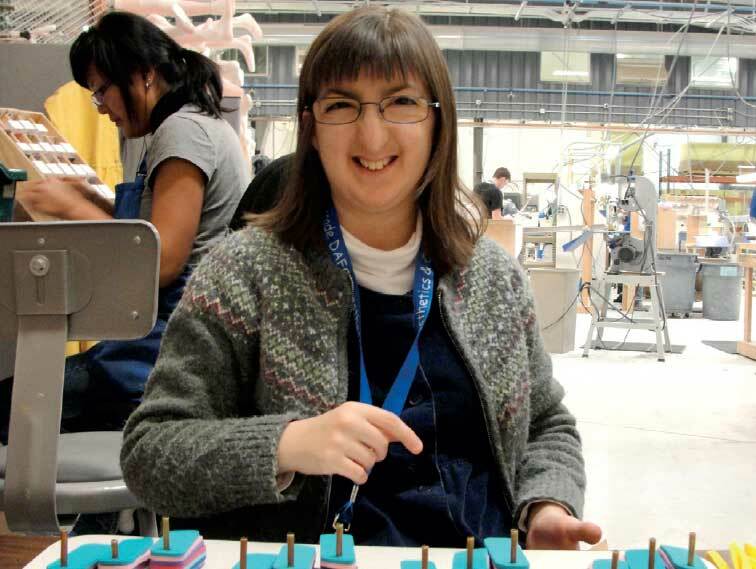 The DAFO personnel worked with Cascade Connections and made a few minor adjustments to her work station, such as finding a chair that was easier for Charity to use with her braces. But, for the most part, the system in place for creating the “flippers” was set up according to universal design practices. Charity’s coworkers provided the typical training for this position and Cascade Connections helped Charity learn how to meet all the standards of the job. Dennis, the production manager, said “hiring Charity gave us an opportunity to give back to the community, helps creates a product that we need, and frees up labor so that we can have other employees perform more complex tasks.” Cathy Thomas noted, “Charity has grown in both her skills and her confidence since starting at DAFO.” She continued, “when Charity was hired, she was on the shy side, but as the months passed she has truly opened up.” With a regular schedule, Charity greets many of her same coworkers each day and has also learned new tasks besides “flippers” and loves trying additional new tasks to help out. Cascade DAFO has expanded employment opportunities for individuals with disabilities in Whatcom County. Cascade Connections congratulates them on their success and recognizes them as an innovative employer in our community. Charity has also been working with Cascade Connections Home Care department for the past four years. Nicole, a Home Care Program Coordinator, had a chance to interview Charity’s mother, Nina, about her experience working with the Home Care department and she had some wonderful insight to share. Nicole: How did your family get connected to Cascade Home Care? Nina: It was a combination of an inquiry regarding respite care possibilities with our DDA case manager and then Cascade Vocational Services which was already serving Charity. Nicole: How long have you been with Cascade Connections and how long have you been with Home Care? Nina: I think about 6 years for Vocational Services and about 4 years for Respite [Home] Care. Nicole: How would you describe Charity’s life up to this point? Nina: Charity is a petite, spunky, enthusiastic 28 year old gal who is nearly always eager for the next adventure. She currently lives at home with her parents, 2 cats and a dog. She works part time at Cascade DAFO, a job which she loves. Her favorite things are listening to stories and music on CD’s, looking at picture books, doing puzzles, watching movies (especially Pixar and Disney), anything to do with Winnie the Pooh and last but not least, hanging out with her care aide. They usually go out the house, just the two of them and visit her friend, eat out, visit local attractions including parks, specialty shops, museums and/or sometimes attend CAP events. She enjoys family time too, which includes being one of 7 siblings and an auntie. Nicole: What are some the moments that have stood out with Charity and her care aides? Nina: Her expression of glee and delight whenever she talks about her care aide- which is often. She always returns happy and content from her outings with her care aide, eagerly anticipating what’s up for next time. Nicole: What would you tell another parent if they were considering working with Cascade Connections? Nina: My experience with the staff at Cascade Connections has been that they really listen, so if you ever have any concerns be sure to share them and they will do their best to accommodate. Nicole: Is there any time you feel a staff member has gone above and beyond for Charity? Nina: They have been very understanding about matching the care aid that best meets Charity’s needs and personality. We greatly appreciate Nina sharing some of Charity’s experiences. Getting to spend time with Charity in the community and with some of her daily activities is a privilege and we are grateful to be a part of her life. We also want to thank our supporters for your prayers and financial support. By partnering with us you help people like Charity and help them to live and work and be part of their community.